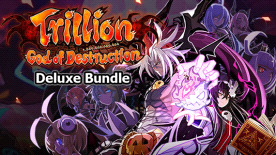 This Deluxe Bundle includes Trillion: God of Destruction and the Deluxe Pack DLC. Uncover the Underworld's secrets with the 7 Digital Novels about each Overlord, Character Art book, and Rough Sketches Art book! The PC Wallpaper and Original Soundtrack brings the Trillion's destruction of the Underworld straight to your home! Deluxe Pack DLC includes the following contents!